Foreclosures continue to decrease. 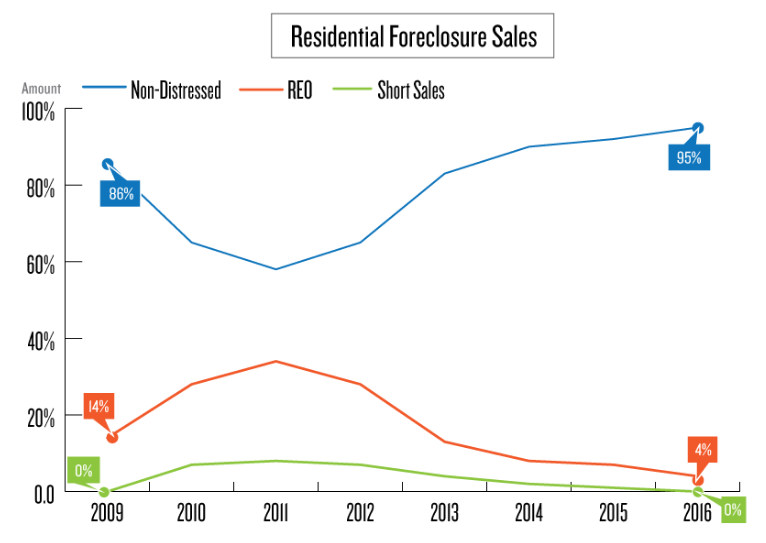 This chart shows a seven-year history of foreclosure and distressed home sales in Flathead County. The high point of the distressed home sales occurred in 2011 when 33.6 percent of the sales were bank-owned (REO) properties and another 8.4 percent were short sales. In 2011, the median sales price of bank-owned properties dropped to $145,050 and the short sales median price was $164,000. The 58 percent of sales that were non-distressed sales had a median price of $210,650, but the bank-owned and short sales brought the overall median for 2011 down to $180,000. Since 2011 the market has seen steady improvement and in the first 10 months of 2016, only 4.3 percent of the sales have been bank-owned homes with 0.4 percent being short sales. The other 95.3 percent have been non-distressed sales. The 4.3 percent that were bank-owned homes have had a median price of $174,000 and the non-distressed sale have had a median of $259,900 with the overall median being $255,000. The bank-owned and short sales have been reduced to a point that they have very little effect on the overall market. The high point of bank-owned homes that were listed for sale was in February of 2012 when there were 168 on the market. In November of 2016 this number has dropped to a total of six.